Routescene® is a global operation. Routescene® is a registered trademark of Mapix technologies Ltd and Routescene Inc is our American sister company through which we do business in North America. Mapix technologies Ltd provides products and solutions which enable customers to collect, manage, visualize, analyze and share high value geo-referenced LiDAR data to improve commercial decisions and performance. Our company cultural values declare the principles and approach to business that steer Mapix technologies Ltd and Routescene. We recruit staff who exhibit a high competency in each of these values and put them into practise daily for the good of customers, partners, the industry and the business. We have a track record of working hard to get the job done. We have a can-do attitude and exhibit passion and excitement in our work. We speak plainly and truthfully to earn trust and maintain confidence. We do what is right and do not cut corners ethically. We communicate clearly and articulately to bring clarity to everything we do. We are effective and capable to produce significant output with minimal wasted effort. Mapix technologies Ltd, established 1996, operates internationally and provides products and solutions which enable customers to collect, manage, visualize, analyze and share high value geo-referenced LiDAR data to improve commercial decisions and performance. 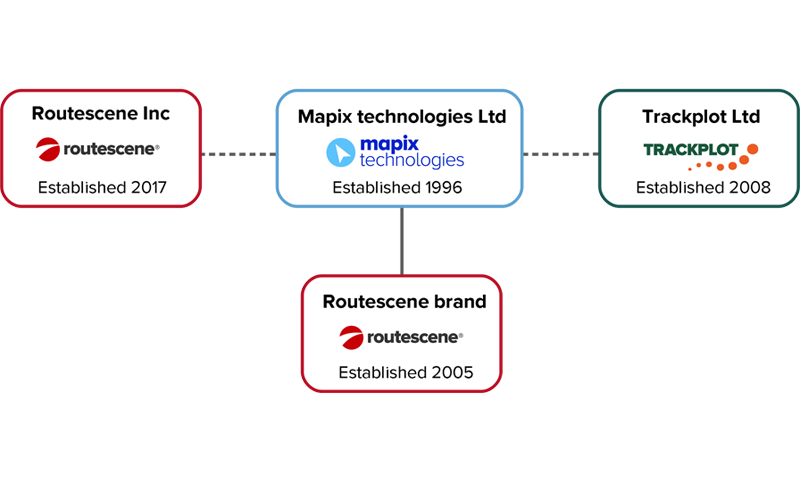 The Routescene brand was established 2005 taking the know-how built up in Mapix to develop a 3D mapping product and service offering to the Highway industry. In 2009 Routescene was an early adopter of LiDAR technology (Light Detection and Ranging) to develop a very high resolution low cost Mobile Mapping Solution. In 2013 Routescene identified a gap in the market for a lightweight LiDAR solution for use on Unmanned Aerial Vehicles (UAVs). UAVs and LiDAR are two emerging technologies and the advancements in recent years in LiDAR combined with the commercialisation of UAVs for business purposes has opened up huge opportunities. Routescene realised that applying the two technologies together provides for a very strong mix which could transform the surveying market.